ViewObject. Working with multiple RowSets. 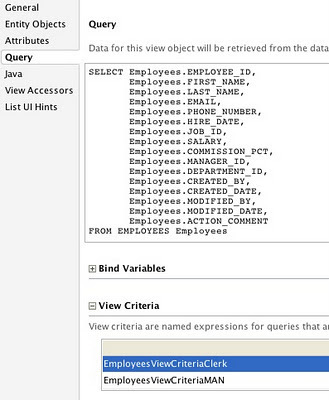 Let's say we have a ViewObject with quite "heavy" SQL query from performance point of view. We need to show ViewObject's rows in two different tables on the same page and rows in the tables should be filtered in different ways. For example, we have a query from Employees table and we need to show separately clerks in one table and managers in another one. And let's suppose that the query is very heavy, so it's preferable to be executed once only. It would be nice to retrieve records from database once and after that filter them in memory and show in appropriate tables as many times as we need. In most cases we work with ViewObjects containing one "Default" RowSet only. ViewObject creates it internally and implementing RowSet interface delegates it's methods to the "Default" RowSet. But ViewObject can support more than one RowSet. Except internally created "Default" RowSet we can create "secondary" RowSets. This feature can be very useful for our usecase. 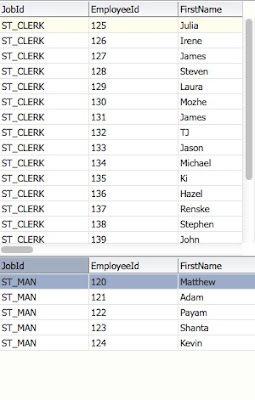 We're going to use "Default" RowSet to retrieve all rows from database and create two "secondary" RowSets (clerks and managers) with filtered in memory rows. These "secondary" RowSets we will show in our tables on the page. //Let's remove the rowset from VO's rowsets table. //And put it back. Next time we'll be able to find it by name. These two methods should be exposed via client interface to be accessible from the binding layer. 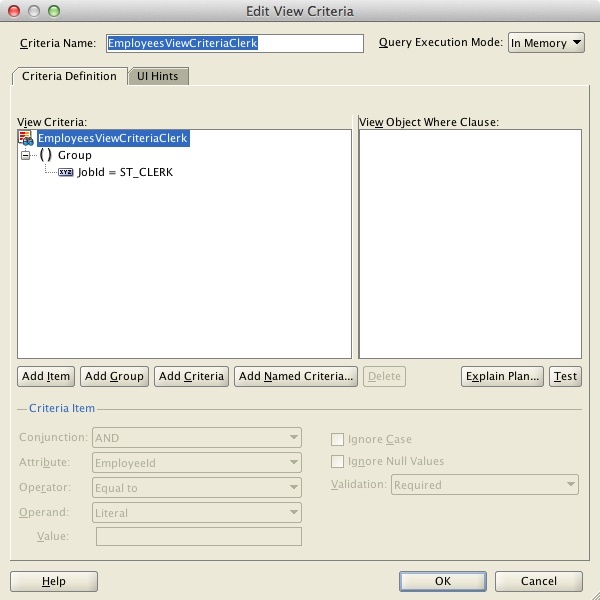 The first activity is a method call, executing query of EmployeesView instance. 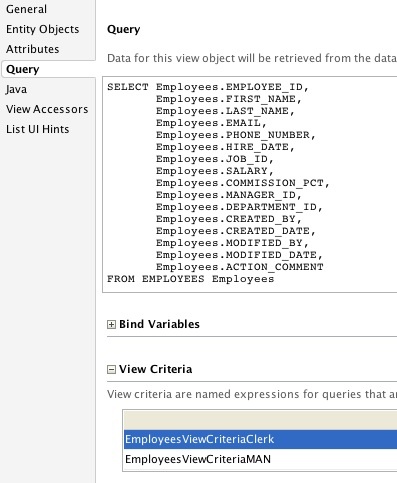 So, on this step we're going to retrieve rows from the database. In order to retrieve all rows, be sure, that Fetch Mode attribute of the ViewObject is set to FETCH_ALL. 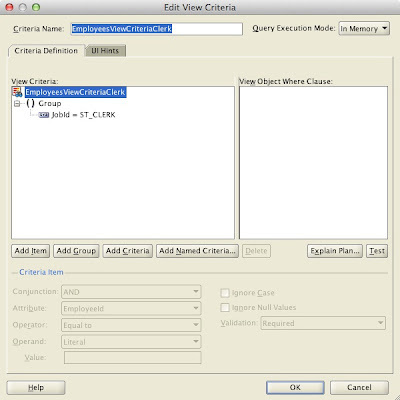 Note, that Instead of Iterators we use methodIterators representing results of methodActions getManRowSet and getClerkRowSet and these methodIterators are set in IterBinding attributes of tree bindings EmployeesView11 and EmployeesView12 that are used by our tables on the page. You can download sample application for this post. 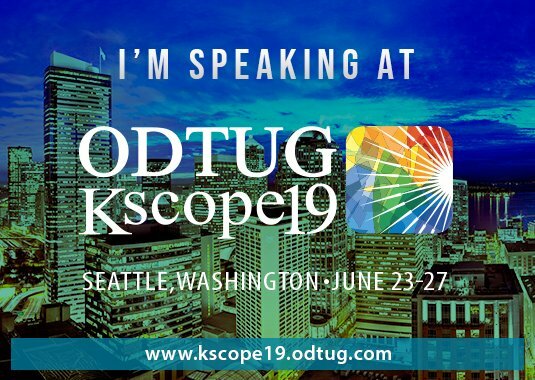 It was designed for JDev 11.1.1.2.0.